In 2017, Spotify launched its Secret Genius Awards annual event to honor songwriters and producers behind some of the streaming platform’s most-played songs. 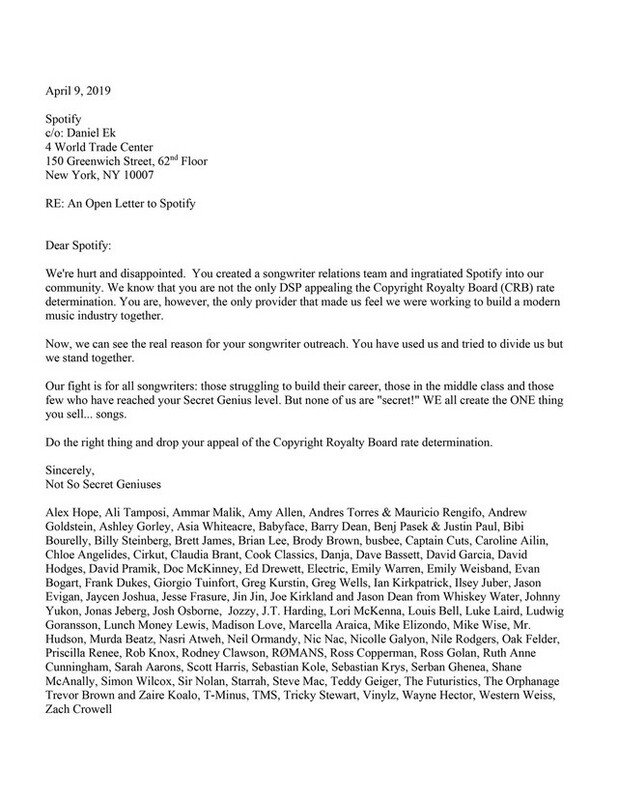 But now some of those same honorees are speaking out about something much less celebrated — Spotify’s plan to appeal Copyright Royalty Board rates, along with Google, Pandora and Amazon. In January of last year, the Copyright Royalty Board ruled songwriters and music publishers would receive higher payouts from on-demand subscription services like Spotify and Apple Music, a decision that was announced by the National Music Publishers’ Association (NMPA). “We are thrilled the [Copyright Royalty Board] raised rates for songwriters by 43.8 percent — the biggest rate increase granted in CRB history,” said NMPA president and CEO David Israelite in a statement at the time. After the decision was finalized this past February, the those leading streaming services — with the notable exception of Apple — appealed the CRB rate determinations, citing “serious procedural and substantive concerns” as the grounds for their appeal. “If left to stand, the CRB’s decision harms both music licensees and copyright owners,” the appeal argued. The move has received widespread criticism from songwriters, music publishers and organizations that advocate for their rights, including the NMPA, Nashville Songwriters Association and Songwriters of North America.